When to Follow Up after Job Fair? One is very ambitious and has planned to take things into hands for the future by attending a job fair to get the best job for the career. People get a handful of information through such fairs, like viewpoints of possible employers on the resume, tips on interviews, or at least a brief discussion with them about career prospects. After the fair, start evaluating about how it all went, how well the impressions were made, what are the possibilities people would think about of hiring you, what knowledge has been acquired regarding the job positions, how well you presented and socialized with people. Then, it is the time to follow up after job fair with a recruiter. You cannot lay back and only keep evaluating regarding how job fair passed but now is the time to follow up. Sort all the collected business cards and enlist the companies you plan to follow up. The possibilities of losing a good opportunity are likely when you do not follow up for a week or two. It is enough for the employers or recruiters to forget about the meet and think you are not interested. Approaching after a week or two would look like you are not in need of a chance to an interview and the chance will be then forwarded to someone the employer finds persistent and in necessity of a job. Just like interviews, follow ups are to be well prepared for. Prepare a document or track all the information of the representatives of organizations or human resource recruiters you met with. Arrange the business cards and try to remember the conversations made. Once a position is planned and decided, the apt organizations have been listed down which meets with the prospects you are looking for start equipping for the follow up. Understand the whole procedure’s depth by knowing the exact meaning of follow ups. One can send a thank you email within 24 hours of the job fair attended. Later after a day or two it should be followed up with a resume and notice of how you are interested in the company or organization of the recruiter you discussed prospects with or employers you met with and who shared business cards with you. Its main purpose is to show consistency, reintroduce and emphasize the interests of one. Choose apt source of communication. Mails have been officially used more these days and can be of great aid for follow ups too as well. Within a period of 24 hours make sure you are sending a thank you note. Personalize it with mentioning points that were discussed at the job fair to connect with the recruiter or employer, who will then recall the whole conversation. Appreciate the organization and the employer well in the note. You have to thank the recruiters to have attended the job fair to keep it professional. The best time to follow up is after 24 hours of the thankyou note sent. By this time the recruiter has been poured with plenty of thank you notes. The next day is when the recruiter is open for the new approaches. Refer to statements made during the job fair and in the thankyou note so that you are recalled well and follow up with essential details as to why you are following up. Comprehending your current position in life whether you are graduated or yet to be graduate or planning on leaving a previous job or planning to work for the first time, accordingly you have to follow up. If you are yet to be graduated the best time to follow up is the week in which the job fair was attended. If you are planning to work later it will be appropriate if you still follow up with latest updates in your resume. Request the recruiters or employers to hold the resume for future consideration and prospective position you are interested in and keep the follow up going till graduation. Soon after graduation,it is the time to refresh the memories of the recruiters by following up with details referring and indicating to previous notes, conversations and follow up mails. When you have graduated and planning to begin working or if you have planned to opt for a new job; one chance is the need of the hour. And to get a chance it is essential to follow up after a job fair and almost get an interview fixed. This is the most essential moment when the follow ups are counted. Make a note on whom you approached and when, you’re best chances lay within the week of the job fair and pitch the best. It is beneficial if personal contacts through calls and emails can be established between you and the recruiters so that you get sufficient knowledge on the time schedule the recruiter maintains to attend and consider the follow ups. Ask and enquire when is the apt time to follow up with basic materials to add up recruiter’s knowledge about you. It is then when you deliver your interests and this will make a good impression about you amongst the recruiters, that you are considerate towards them and that you do not plan to irritate or disturb through your pursuance but approach in a qualitative way to maintain the best potential future relation with the recruiters. Be in contact with those recruiters of whose job positions doesn’t suit you or interests you. Try to thank and follow up these recruiters too. Describe the whole prospect of your abilities, interests and aims and make sure you are considered only for the jobs that align with your goals. Likelihood of the recruiters suggesting or recommending your name to fellow recruiters who are seeking for candidates, for job positions that meets with your requirements are more and like any follow up try to build a constant touch by persistently inquiring whether a position has been suggested by any fellow recruiters. Know what opportunities are available in organizations only if you find the right vacancy can you begin to follow up with an employer. Volunteer to know more about the company by surfing through company websites. Apply when internship vacancies is found in case you have just graduated. Know which openings are coming around on and when so that you can follow up around their time period. 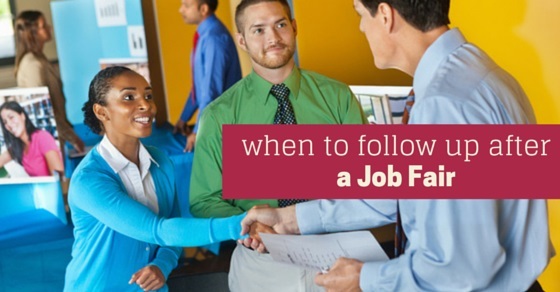 After the first follow up past the job fair, try to follow up again in another week if you have not received any feedback or information on your application. Think about how important the company is, bearing the career prospects in mind and then choose to again follow up the same company. If the same company does not interest you there were clearly many business cards you received so try building second follow ups with each. Do not show disappointment on not getting any reply as the employers or recruiters must have been busy with plenty other job requests and applications. When you have sent a mail immediately follow with a call or message to the recruiter or employer. If you do not hear anything back send the mail all over again within six days of time. Devoid of a round of follow up, you will never know if you were not a possible candidate or you just got lost in a pile of emails. When you want to follow up the third time depends on what vital roles each of the companies plays in your career, if possible try and follow up to each companies in the third following week. Above given were some tips on how officially the follow up works and at what time is the right moment to approach an employer, but there are few tips by employers themselves who share how they get impressed when they are approached at a particular time. Some employers are impressed by a thankyou note immediately after the job fair; this can happen in case when you had a very close talk regarding career with the employer and were given good advices, or simply because you had to pitch yourself through thankyou note. In some cases the candidates have been freely spoken about the job aspects during the job fair with the potential employers, so there develops a scope for the candidate to send resume and related references to the employer the same day after the job fair. Until you have accepted a new job offer, make sure you are continuously pursuing leads. Job rejections are not pleasant, but everyone goes through them at one time or another. Throughout your job search remember to uphold optimistic attitude, active approach that brought you to the job fair in the first place. Each links and discussion is a chance to move forward. Be persistent in your approach and understand the best time one can follow up is immediately after the job fair. To remember one out of so many applicants is difficult for the employers and recruiters thus the only equipment is to follow up and keep the momentum on till you land a job.